To some, a brand is little more than a logo and the consistent use of color, type and tagline. In reality, a true brand communicates everything you do — and all the reasons customers should select you, your products and your services. Are you passionate about a social mission? Have an idea for a social enterprise? Check out this talk lead by the founders of Chrysalis Pops — a Madison, grown local, organic, frozen fruit pop social enterprise that promotes mental health recovery. Bowl for Kids Sake night on Thursday, April 25, from 6-8 p.m. at Middleton Sport Bowl. Join us for a festival full of family fun activites, games, Cars Curing Kids Car Show, and much more! Discounted fees on removal costs for members of the Middleton Chamber of Commerce. $1 from every Community Burger sold now through the end of April will be donated directly to Gio's Garden, a therapeutic respite center which seeks to grow into a one-stop special services delivery organization for special needs children and their families. Tom Marks, a nationally acclaimed sales and marketing thought leader, author and speaker will join us to discuss why every company needs to be a thought leader and how to use it to drive greater revenue, more effective marketing, and a better understanding of the importance of corporate ethics. Is your business growing? It might be time to move into a commercial space! But where do you even begin? Join us for weekday lunch 11am - 3pm M-Th, and save 10%. Be the Magic! Register your team. Become a sponsor. Be a design expert for a team. There are many ways to be part of the magic (and we need you all)! The classic burger & wine pairing, taken to a new level. Enjoy our mouth-watering Prime Burger, a combination of USDA prime beef, Wisconsin cheddar cheese and peppered bacon, accompanied by a glass of Paraduxx, a Proprietary Red Blend from Napa Valley. Kids Building Wisconsin is a fun, free event with a focus on getting kids interested in the numerous exciting careers available in the construction industry. Chamber Members Get $333.33 OFF Your Next Exterior Painting or Interior Painting Project in Madison! 3rd Gen Painting and Remodeling is the #1 Rated Painter in Madison WI as of 2019. We specialize in interior painting, exterior painting, wood & composite Trex deck building, and home remodeling in Madison & surrounding Dane County. With Spring right around the corner, now is the perfect time to plan a getaway! We are happy to offer the Spring Special* rate at any of our North Central Groups hotels. Specialty trips design just for the girls! 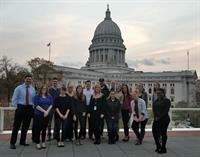 We are currently looking for members to join our Young Wishmakers of Wisconsin young professionals group. You can make a difference in the lives of children facing life-threatening medical conditions by joining Make-A-Wish® Wisconsin’s Young Wishmakers of Wisconsin. We’re seeking dynamic young professionals with diverse interests, backgrounds and professions who are passionate about being active and philanthropic members of their community. 6 Steps: To a Better Business. JOIN US for this lunch & learn event. REAL PEOPLE. REAL RESULTS.